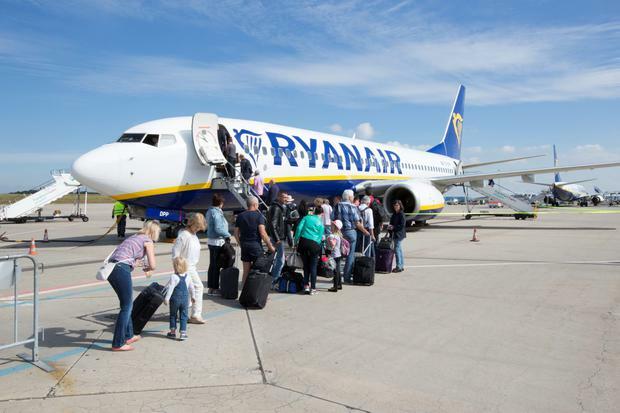 Passengers travelling with Ryanair have until the end of November to adapt to its new cabin baggage rules, the airline has confirmed. The new cabin baggage rules, which no longer permit 'Non-Priority' customers a free larger carry-on bag, were scheduled to be introduced on November 1. However, a grace period will now continue until the end of the month. "While our new bag policy came into effect on November 1, we have briefed our gate agents to take a reasonable approach while customers get used to the new rules over the month of November," Ryanair told Independent.ie Travel. The new policy only allows passengers who pay €6-€8 for Priority Boarding to take a second, larger piece of cabin baggage on board its aircraft. 'Non-Priority' passengers must travel with a small 'personal bag' only, or pay €8 in advance online to check the larger, 10kg bag into the hold. From December 1, 'Non-Priority' customers who show up to the airport with an unbooked larger piece of hand luggage must pay €20 to check it at the airport bag drop desk, or pay a €25 fee to have it placed in the hold at the boarding gate. While many passengers agree with the changes, others have complained about paying for checked bags or Priority Boarding, only to watch customers who haven't observed the new rules get their bags tagged for free at airport gates. @MoneySavingExp another ridiculous policy from @Ryanair not being followed. People who pay priority boarding in order to bring cabin luggage on under the airlines “new rules” have to stand & watch people who are not priority get bags tagged for free at boarding. It’s a farce. Ryanair says its new policy has been a success, resulting in an 11pc improvement in flight punctuality and "faster boarding time" for passengers. “We’ve received lots of positive feedback from our customers and airports across Europe that our new bag policy has reduced airport security queues and improved the boarding gate experience," said its Chief Marketing Officer, Kenny Jacobs. The November 30 cut-off means customers will have to adapt to the new baggage policy in the run-up to Christmas - one of the year's busiest travel periods. Ryanair: Are we witnessing the slow death of free hand luggage?